In Cuba, La Reloba is a well known “peso” cigar, which is what the locals smoke. Peso cigars are more or less like bundled cigars: they are economical unbanded cigars sold in mazos, and they cost around one Cuban peso each. Hence, peso cigar. Cigars for export are generally too expensive for the average Cuban citizen. Come to think of it, Cuban cigars are too expensive for the average American these days as well, which is perhaps what gave My Father Cigars the inspiration to release this economical blend. La Reloba is a nice looking stick, as one would expect from My Father Cigars. The wrapper is a smooth colorado maduro with a slight sheen, otherwise marred only by a few unobtrusive veins. The roll is solid and the caps are of course triple-wound. The draw is firm, but not tight, and the burn is even. The coronas I’ve been smoking build a long and handsome ash. The corona opens up with a woody flavor and that trademark Pepin overture — lip smacking tannin and a blast of black pepper. It’s actually pretty restrained compared to higher end smokes from My Father Cigars, but there’s still no mistaking that you’re smoking a Nicaraguan puro. After an inch or so the spice backs off and the flavor becomes a little more basic: cedar, toasted tobacco flavors, and a touch of cocoa on the nose. The aroma is not as complex as you’d find in the Black Label or the Series JJ, but it’s nothing to sneeze at either. After mellowing in the mid-section, the final third turns up the heat, stoking the fires with hard wood and another dose of pepper. It gets a little aggressive at the band, but again, not in the way Pepin’s heavy hitters do. 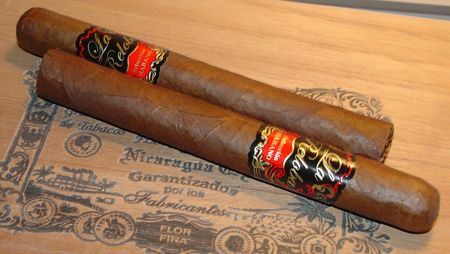 When I feel like a medium-bodied Nicaraguan puro in the Pepin style I usually reach for a Vegas Cubanas or a Tatuaje Havana, and I think either of those would surpass La Reloba in a blind taste test. But one of the most attractive details about La Reloba is the price: the coronas retail for around $4.50 a pop and the torpedos top out around $6.50. That’s outstanding for this level of quality, so the price can not be left out of the equation. 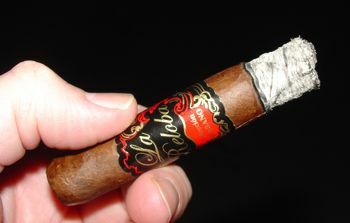 La Reloba is an extremely well constructed cigar available at an excellent price. And while it’s a fine cigar, it’s not as complex as higher-end brands from the same outfit. I think most of us have a balance in our collection between higher priced, complex, gourmet cigars and everyday, affordable, decent smokes. This is one to consider for the everyday job. Agreed on most all of your points — I’ve been sampling the La Reloba lines off and on over the past two weeks, and while they’re a good value smoke, they really don’t deliver the flavor profiles that other cigars in the same price category do. My first La Reloba was the Sumatra and I was really disappointed by the construction and smoking experience. The Habano I had after that seemed to resolve any problems, leading me to wonder if it wasn’t the heat/humidity on the day I was smoking them outside that led to some of the poor performance. Definitely a mid-80s cigar, regardless of wrapper, but a good low-priced smoke from the Garcias.